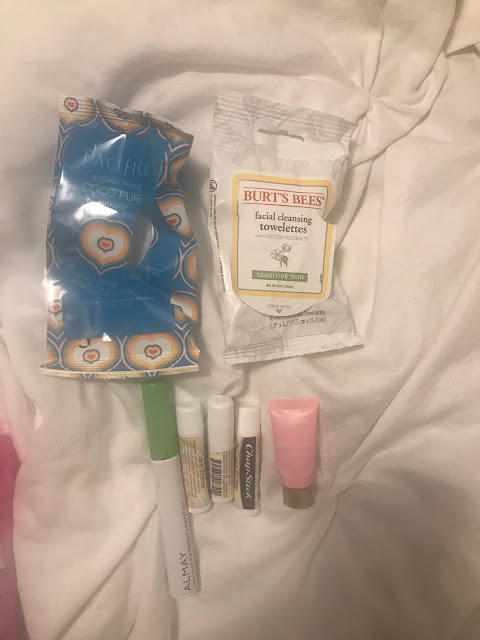 Another month has ended and that means I have a new empties post for you! I really didn't think I had too much to share this month and was pleasantly surprised when I empties out my bin and saw I had quite a few items inside. I have been working really hard at getting through my beauty collection and am trying to stick with one item until I finish it up instead of jumping from product to product like I used to. I absolutely could not get this picture rotated and I have no idea why! 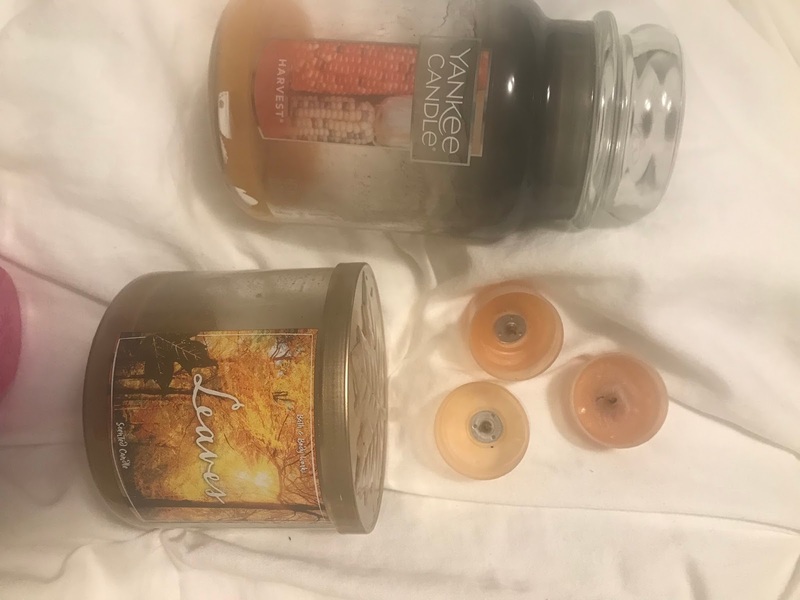 I used up three Yankee Candle Amber Sunset tealights which disappeared quickly but smelt great. I don't think I would repurchase them in the future though. I used up my favorite Bath and Body Works Candle in Leaves which was amazing (per usual). The last candle I used up was Yankee Candle's Harvest and this one was just okay. I received this as a gift but I don't think I would purchase it in the future because it wasn't something I absolutely loved. I finished up one face product this month, Neutrogena Hydro Boost hydrating serum. The packaging on this product is absolutely gorgeous. I did really like it but I don't know that I would purchase it again in the future since I am still on the search for a line of face products that work great for me. Four hair products were finished up in October. The Head and Shoulders shampoo and conditioner was great and my hair and scalp always felt super nourished after using them. 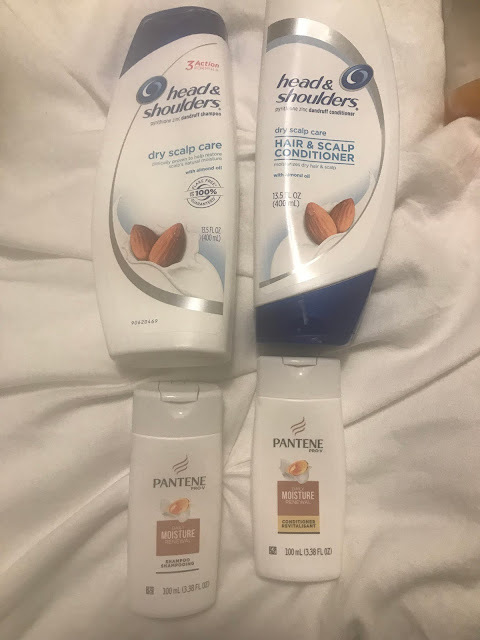 The Pantene shampoo and conditioner samples I used mostly on my Disney trip but I finished them up in October and thought that they were great. I tend to love Pantene because they do a great job making their products super moisturizing. I would definitely purchase all these hair products in the future. I finished up a full size lotion and a mini lotion. 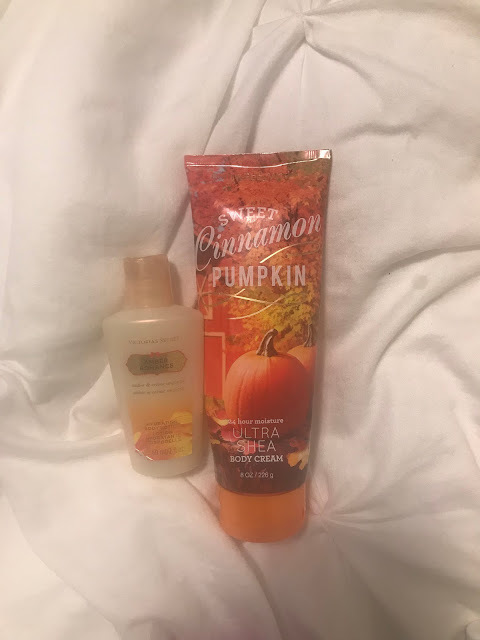 The full size is Bath and Body Works Sweet Cinnamon Pumpkin. I wasn't a huge fan of this scent and I'm glad that I was able to use it up in the fall. I won't be repurchasing this again in the future. The mini lotion I finished is Amber Romance by Victoria's Secret which I also won't purchase in the future. It was an okay scent but definitely not my favorite. 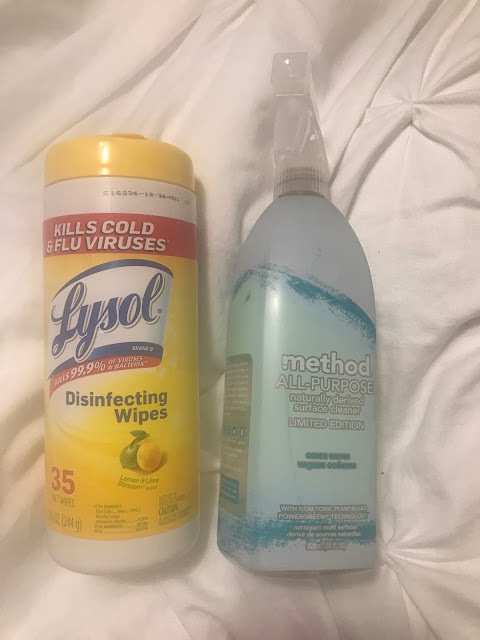 Two cleaning products this month; Lysol Disinfecting Wipes which I will keep repurchasing and Method Ocean Waves Multi-purpose spray which I loved and will also definitely purchase in the future. I finished up three Chapstick Cake Batters which I definitely will repurchase since I use them millions of times a day. The Almay mascara was pretty good and I would consider repurchasing it again in the future. The Clarins face cream was good but certainly not the best I've tried and I don't think I will be purchasing a full size in the future. I used up two packs of makeup wipes. The first was Pacifica which I liked the scent of and worked great at taking off my makeup. The Burts Bees wipes were nice too but I preferred the Pacifica. 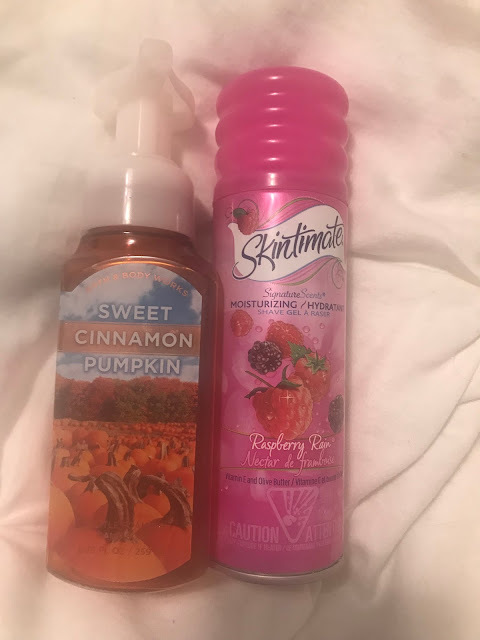 The last two products I used were a Bath and Body Works hand soap in Sweet Cinnamon Pumpkin which wasn't my favorite scent and I'm glad to see go and Skintimate Raspberry Rain Shave Gel which was nice and I will repurchase in the future. That's another 22 items that I was able to use up and get rid of! I can't wait to see what my total was for 2017 and I'm already looking forward to see how many items I'll be able to get through/declutter next year!